The Proton has a long and distinguished evolutionary history of demonstrated performance and lowered risk, making it one of the world’s leading launch vehicles. The maiden flight of the Proton rocket took place on 16 July 1965. The launcher’s lead designer, Vladimir Chelomei, initially designed it with the intention of creating both a powerful rocket for military payloads and a high-performance ICBM. The program was changed, and the rocket was developed exclusively for launching spacecraft.The original name of the launch vehicle was UR-500, but it adopted the name “Proton,” which also was the name of the first three payloads that the rocket launched. Khrunichev debuted its new generation launch vehicle: the Proton M/ Breeze M with the launch of the Ekran M satellite in April 2001. A major evolution from the Proton K launcher is the featured digital avionics on the Proton M rocket. The Proton M rocket paired with the Breeze M Upper Stage, both designed and built by Khrunichev, offers improved performance, new mission design flexibility and increased payload volume under the fairing. 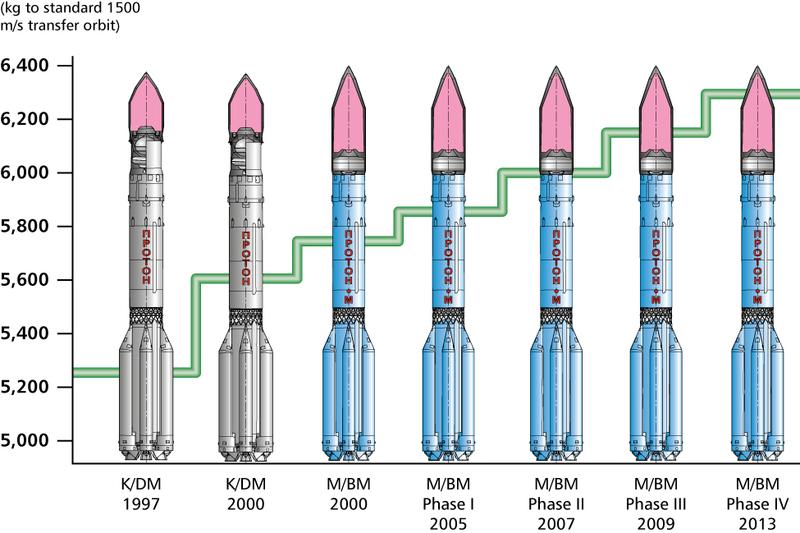 As part of a continuous improvement program, the Phase I configuration of Proton Breeze M launcher enhancements carried out nearly all of the commercial missions in the 2004 to 2009 period. The last commercial Phase I Proton Breeze M flew the Astra 1M mission for SES in November 2008. The Phase II Proton Breeze M rocket flew for the first time in July 2007 with the successful launch of the DirecTV 10 satellite. The last commercial Phase II Proton Breeze M flew the Skyterra 1 mission for LightSquared in December 2010. The Phase III Proton Breeze M launch vehicle was flight proven on the Russian Federal dual mission of Express AM-44 and Express MD-1 in February 2009 and performed its first commercial launch in March 2010 with the Echostar XIV satellite. The Proton Breeze M phase III configuration is the current standard configuration for ILS Proton. This configuration provides 6150 kg of GTO performance, which is an increase of 1150 kg over the original Proton Breeze M, while maintaining the fundamental design configuration. Khrunichev has initiated development of a set of phase IV enhancements in order to keep pace with market demands and the mass growth trends of commercial satellites. The implementation of Phase IV Proton Breeze M enhancements will be completed in 2013. The Payloads Systems Mass performance for phase IV has been increased to 6300 kg to a reference GTO orbit with 1500 m/s of residual delta V to GSO.